Last week I wrote about the Hips for Hipsters Pozible campaign to raise money for researching new antibiotics. 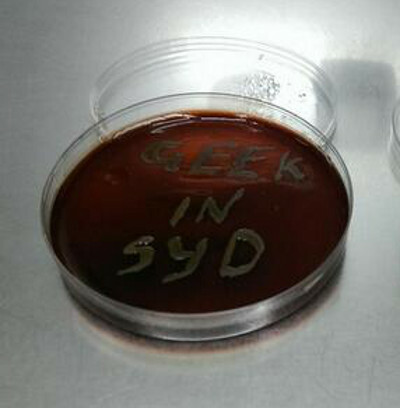 I said that I thought that having rewards more directly related to the science would be preferable, and Dr Mel Thomson listened – Geek in Sydney appeared on a petri dish. Amidst our substantial excitement at this turn of events there was also a debate with our Senior Zoological Correspondent, Dr M, who put forth the position that this might not have been the best use of a scientist’s time. Other crowd-funded science campaigns including earlier ones run by Dr Thomson have tried variations on rewards. Dr Dave Hawkes at the Florey Institute offered backers the chance to name a virus, and for higher-level backers a tour of the facility and lunch. On experiment.com, the dedicated science crowd-funding platform, they take a more bare-bones approach and donors are rewarded with a copy of any published paper. It’s way too early to say what sort of approach works best in crowd-funding scientific research, or even if there is a single best approach. But it is clear that all of these efforts take time, money, and are risky. Doing something like a Pozible campaign would take most people, let alone scientists, out of their comfort zone: As Dr Mel Thomson wrote on her blog. Should I have risked my (barely existent) professional reputation by wearing a beard/flat cap ensemble and dancing with a Hipster skeleton on YouTube or does it endear me to my audience? As my Zoological Correspondent put it: Is this modern-day version of busking the best way for a scientist to get research funding? Well, perhaps the question might better be put by considering if there are any viable alternatives. Even if not the best way forward, it might be the only way forward. With funding for scientific research being slashed all over the place and hard, demonstrable outcomes being demanded alternative funding sources have to look attractive. Not only is there some money available, but it is less restrictively managed than most traditional government grants. And traditional grants do not come without work and risk (just, perhaps, without YouTube videos). Putting together grant applications takes up an enormous amount of the average research scientist’s time; and they have absolutely no guarantee that those grant applications will be successful. Of course the pay-off for success can be much more worthwhile with government or big charity grants – from a cursory look the sweet spot in crowd-fundraising for science seems to be in the vicinity of only $10,000. There is, perhaps, another pay-off in crowd-funding science though. The traditional process is very much hidden from the rest of the community. Crowd-funding has the potential to excite a wider range of people and to make them feel involved in science. I know I love the idea that my small contribution could help discover a new antibiotic and I love the fact that my contribution is going directly to a scientist who’s doing work I think is worthwhile. Just as a pure science communication exercise I would rate something like the Hips for Hipsters campaign a success. The more I think about it, it seems to me that inviting the public into the science experience – whether that’s with a tour, a name on a petri dish or a the chance to name a virus – is a wonderful way of raising science awareness and a fulfilling way of getting funding. Even though raising $11,000 to research new antibiotics is looking like a stretch right now I have a feeling we’re going to be seeing a lot more crowd-funded science projects. I think that’s a good thing, not because of the funding which I believe should largely come from the Government, but because of the potential to actively involve the community in scientific research. Which is a good use of a scientist’s time. Moreover, this is not an either-or choice. Increased funding through crowd funding does not decrease the amount of funding available from government, private sector or philanthropic funding sources. Crowd funding increases the total pool of funds available for research. It also makes the research funding ecosystem a bit more robust by providing a new model for research funding.